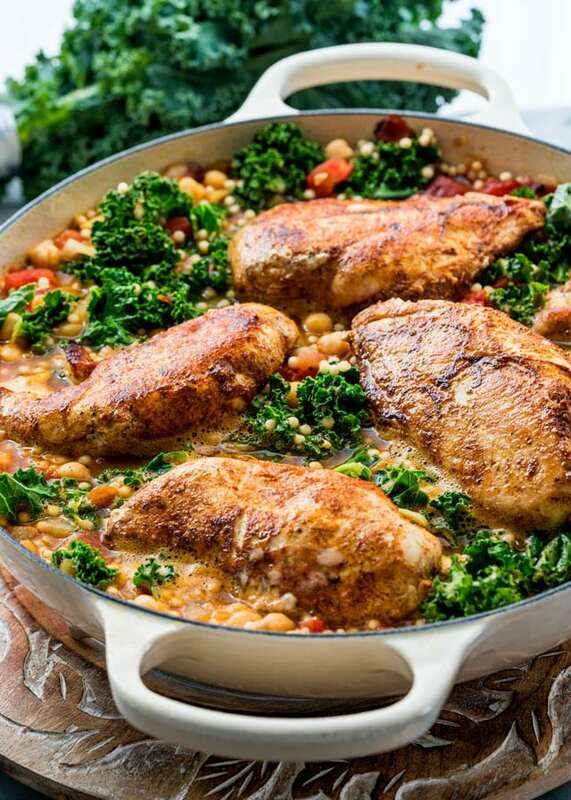 This Moroccan Chicken Couscous is super flavorful and healthy loaded with exotic spices but still simple enough to make any night of the week. I’m so excited to share with you today’s recipe because it’s so good, loaded with delicious flavors and it’s even healthy, at least in my book. I love taking you on a trip around the world, at least cuisine-wise, without even leaving your house. Today we’re going to Morocco with all these exotic spices. Trust me, you’ll love it and have fun. I don’t know about you, but I actually have all the spices listed in this recipe in my spice cabinet, maybe I am a spice snob, but I do love my spices. Thing is, I bought most of them once, when hubs and I made a trip downtown to a really nice spice store. I filled up on all the spices and bought all the little jars. I love my spice cabinet, and hubs even organized it all for me and labeled all the jars. Yeah, he’s great that way. Anyway, having just admitted to being a spice snob, I know most of you probably won’t have most of these spices, so you can also use the store bought Moroccan spice blend. But this dish, this dish is EVERYTHING. You’ll want to sear the chicken first to get that nice crust on the chicken which will be the best part. Yes, you can use chicken breast with skin and bones, and yes it will be even better than the skinless one, it will add a lot more flavor, but the skinless chicken worked just as well, it’s still really delicious, totally up to you which one you use. I also used a couple tablespoons of the spice to season the chicken, but feel free to go nuts and use more. I’m not judging, and as far as I’m concerned the more spice the better. Now please realize that I just made up this recipe and I’m not claiming it’s a authentic dish or anything, so if you’re Moroccan or an expert on Moroccan cuisine, please don’t judge. I basically just made this up, so this is my version of Moroccan chicken couscous. Glad we got that squared right away. One thing I do know, is that in Moroccan cuisine they sometimes use dates or raisins in their dishes, so I went with golden raisins here. I wouldn’t skip the raisins because they truly add a nice sweetness to the dish. The fire roasted tomatoes are probably not Moroccan at all, but I know I’ve told you before I love them, adds so much more flavor to your dishes than regular diced tomatoes. 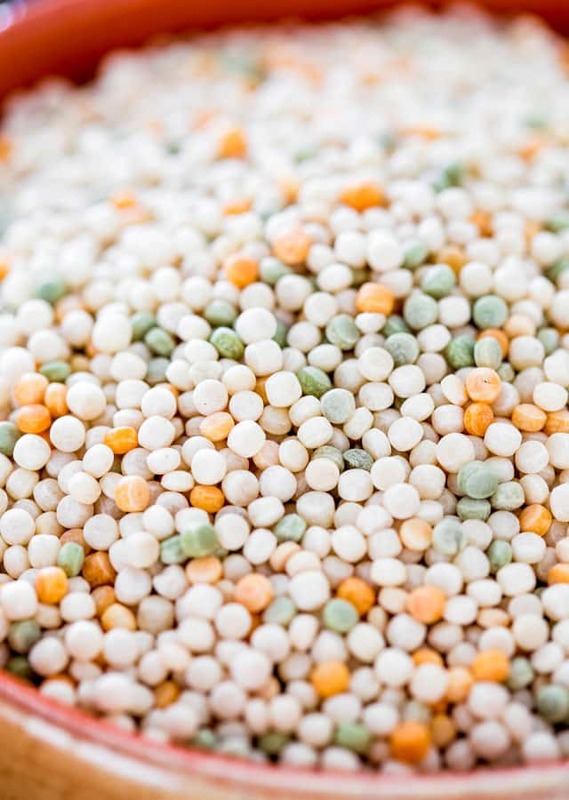 If you’ve never had couscous before or cooked with couscous it is in fact little pasta pearls and not a whole grain, as some people may think. Couscous is very versatile, you can make hot dishes or cold dishes with it, or it could be used in all sort of salads. Pearl couscous, sometimes also called Israeli couscous, can be found anywhere now, I find mine in my local grocery store. Pearl couscous is the same as regular couscous but just a bit bigger and sometimes as you can see here it comes in various colors. Too cool and I thought it would be perfect in this dish. I was right, as usual! One last great ingredient I used here that is worth mentioning is the kale, another ingredient I would recommend not omitting. As this cooks the kale actually crisps up a bit in the oven, and it’s so great, plus it adds nice color to the dish and it’s also healthy and good for you. Now go make this, you’ll love it! If you loved this recipe, try my Moroccan Style Roast Chicken and Potatoes! Combine all the Moroccan spice blend ingredients together. The recipe should yields about 8 to 9 tsp or about 3 tbsp. 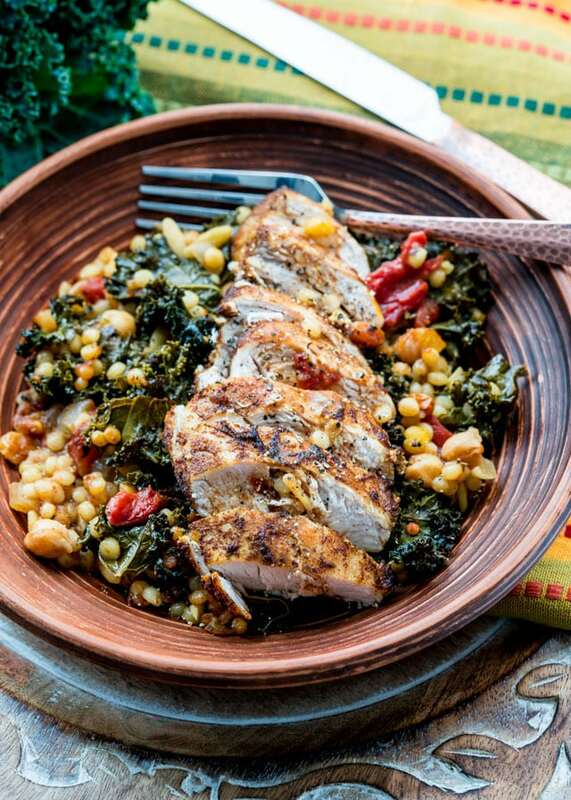 Season the chicken breasts with 2 tbsp of the Moroccan spice blend thoroughly. Use more as preferred. In a large Dutch Oven or a oven safe pot, heat the olive oil over medium-high heat. When the oil is hot add the chicken breasts and sear on both sides until browned, about 2 to 3 minutes per side. The chicken will not be cooked through at all, it will just be crispy on the outside. Transfer the chicken from the pot to a plate and set aside. Add the onion and garlic to the pot and saute for about 3 minutes until onion softens and becomes translucent and garlic is aromatic. add the remaining 1 tbsp of the Moroccan spice blend and stir. Add the golden raisins, chickpeas, fire roasted tomatoes, chicken broth, couscous and stir well. Gently stir in the kale. Bring to a boil, then add the chicken breasts back. Cover the pot with a lid and place in the oven. If your pot doesn't have a lid, cover with aluminum foil. Cook in the oven for 30 minutes with the lid on, then remove the lid and cook for an additional 30 minutes. Heat oven to 160C/340F. Put 5-6 tomatoes on a baking sheet with 2 crushed cloves of garlic. Sprinkle with 2 tsp thyme, drizzle with balsamic vinegar and olive oil, add some salt and pepper and roast for 1 hr. Remove and set aside to cool. You can also use store bought Moroccan spice blend instead of making your own, you can find it on Amazon here. You can also use chicken breasts with skin and bones for additional flavor. Chicken thighs or drumsticks are also fine. I used a large Dutch Oven Braiser that is oven safe. 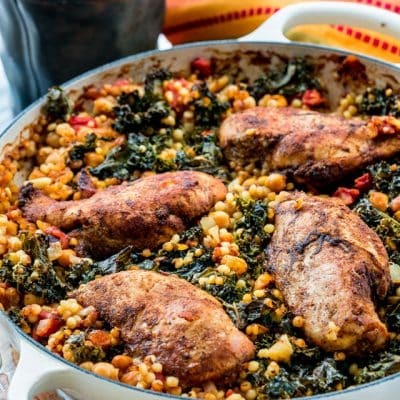 A tagine would also work great with this recipe. Made this tonight, it was Delicious! Love this I subbed spinach for the kale, dried apricots for the raisins and used bone-in chicken thighs, otherwise I followed the recipe. Delicious! And we have leftovers for lunch today! My only criticism is that unlike the stated narrative, it wasn’t simple enough to make any day of the week – at least not for me. Oven time alone is an hour, another half hour of prep and you’d be hard pressed to get this on the table before 7pm on a work day. Worth it for a Sunday dinner though. Made this dish for dinner with a friend. She absolutely loved it. Very nutritious and flavorful dish. I loved this recipe! I may omit the couscous the next time to be more keto friendly so I won’t feel guilty eating it for a couple of days! Thank you so much for sharing it! This is seriously so good. I doubled this and substituted spinach for kale. My whole family loved it! This recipe is amazingly delicious! One of my favourite dishes at the moment. Thanks for sharing! This recipe showed up in my email. I knew I had to try it and I wasn’t wrong. Thank you for sharing it with us, it’s absolutely delicious. I made it for my parents and hubby, didn’t even do a test run and everyone loved it. I mean…really loved it! I did use more of the spice mix, mostly because it accidently spilled into the pot…I’ll use the same amount again. What a wonderful blend of flavours…mm mmm mmm. I love hearing this, so glad you liked it!! Wow, thank you sooo much for this recipe. It was fabulous! Every single person in my house loved this, even the 3 and 5 year old! What an enjoyable and satisfying meal. The instructions were very easy to follow and the recipe was easy to put together. Hi somehow I missed fire roasted tomatoes. How do I make them, and what could I use instead? We bought the roasted tomatoes in a can or you can roast tomatoes in your oven if you would like. I did find this which will help you with roasting them on your own. Hi Jo, I love the recipe. What it might lack in authenticity, it makes up for in great flavours that might entice cooks to try the wonderful cuisine of Morocco. I too am a bit of a spice snob…and my friends know it and are always bringing back items from their travels. I enjoy your blog so much! 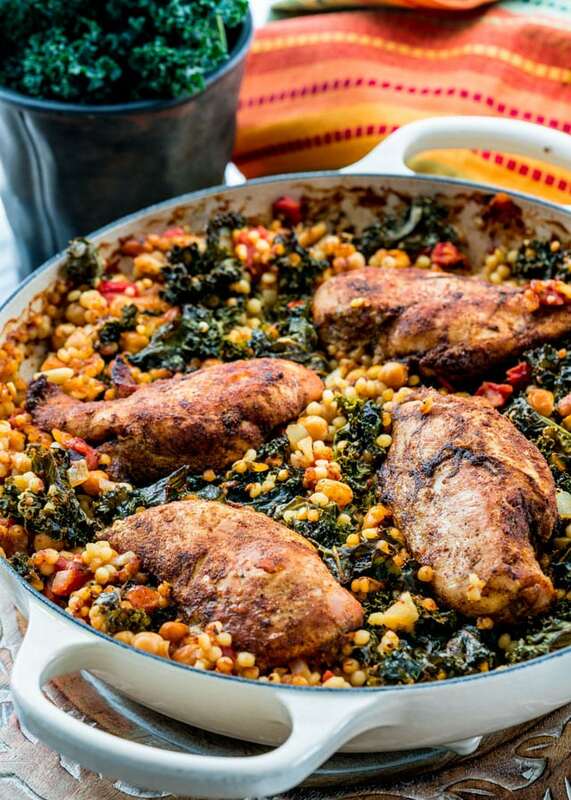 Wonderful chicken recipe – I love the pearl couscous so much more than the regular! super use of spices!